The rebuttal, then, is that the focus on tests is required to prepare students for college and college entrance exams, and deviating from that goal perpetuates the gap between the privileged and the under-privileged. Those other skills are meaningless without a thorough grounding in core academic content. The solution is to improve the test to require critical thinking and higher order skills in addition to subject matter factual and procedural knowledge. To which the response is that a focus on test scores to the exclusion of the skills that lead to real career success disadvantages those students who don’t have access to the richer learning environments that emphasize them. Stepping away from simplistic characterizations, I think no one will argue that students don’t need both. The question arises in how best to get there. Consider the diagram below. Resigners are students who have low academic achievement and little or no ownership of their learning. Whether they are still physically in a classroom or not, they are disengaged and have, in effect, dropped out, finding their conditions intolerable. Hobbyists are students who have complete ownership of their learning, but apply it to non-academic areas. They have tremendous skill and interest in areas they are passionate about such as coding, on-line gaming, skateboarding, journalism, crafts, fan fiction or other narrow fields that don’t provide broad core academic content. However, through technology and ready access to communities of interest, these passions drive students to develop ownership of their learning, collaboration through networks, reputation management, rigorous argument construction and use of evidence, growth mindset (within this context), persuasive and informative writing skills and more. Compliers are the “good” students who get good grades and follow the rules. They may be low in engagement and self-direction, but they comply with the expectations placed on them by teachers and parents to excel academically. Scholars are students who apply the passion and self-direction of the hobbyist to academic learning, developing both content knowledge and career skills. One side of the argument is focused on moving students from the bottom two quadrants to the top two. There is great work showing how adding rigor and a systematic data-driven improvement process can shift students from low academic achievement to high academic achievement. The book Leverage Leadership: A Practical Guide to Building Exceptional Schools by Paul Bambrick-Santoyo is an immensely pragmatic guide for improving academic achievement by adding rigor and a data-driven process. Although, this book is strictly focused on improving test scores, the same process of rigorous improvement can be applied to other desired student outcomes such as growth mindset, agency, ownership, critical thinking, collaboration, communication, creativity, and so on. These skills, dispositions, and mindsets involve shifting students from compliance to ownership, which requires a data driven process plus a gradual release of control from the teacher to the student. There are three paths to shifting students from Resigners to Scholars. The first is to add rigor to move first to the Complier quadrant, then activate intrinsic motivation to move to the right to the Scholar quadrant. 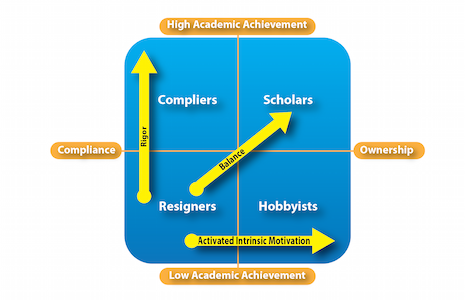 The second is to balance increased rigor with activated intrinsic motivation to move diagonally straight to the Scholar quadrant. 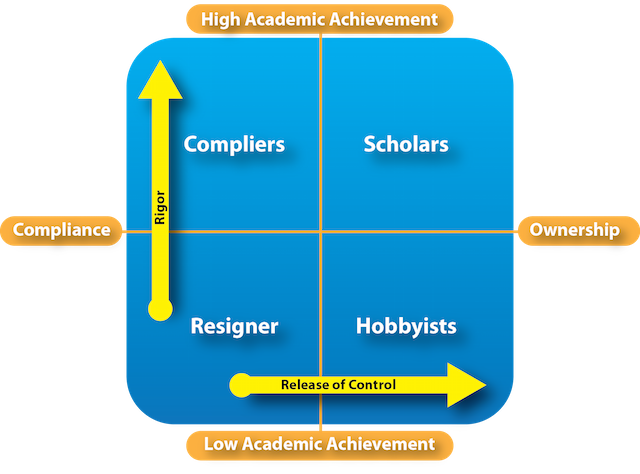 The third is to begin by activating intrinsic motivation to move from the Resigner quadrant to the Hobbyist quadrant, and then add rigor to move to the scholar quadrant. The key, of course, is to avoid fallacies that allow us to be satisfied with “merely” fostering compliers or hobbyists, but to set the goal on preparing students to be prepared for both college and career as well as life in our rapidly evolving world.